When the 1990 English docudrama ""Who Bombed Birmingham?"" cast serious doubt on the guilt of six men convicted of bombing two British pubs in 1974, Prime Minister Margaret Thatcher declared that ""a television programme alters nothing"". But, as Alan Rosenthal concludes, Thatcher was wrong. The film engendered a new inquiry that led to the release of the convicted men. Rosenthal notes that docudrama wields more influence than the average documentary and that ""reality-based stories taken from topical journalism are the most popular drama genre on US and British television today"". This three-part collection of diverse and provocative essays addresses the dominant questions and controversies the genre poses. Defining and examining the rationale of docudrama, the nine essayists in the first part discuss the history and development of docudrama on TV and in film; they also consider the place of truth in docudrama, the main critiques of the form, and the audience's susceptibilities and expectations. In investigating the actual film-making process, the eight essays in the second part focus on how ""docudrama as a 'commodity' is created in the United States and England"". Part essay, part case study, and part interview, this section also explores how Hollywood and the commercial networks as well as producers and writers work and think. 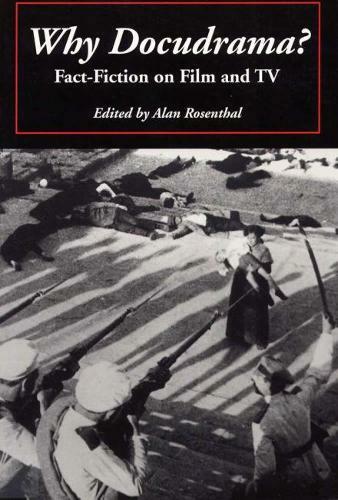 The final part presents an in-depth critique of a number of controversial docudramas that have helped form and shape public opinion, including ""Battleship Potemkin"", ""Roots"", ""Reds"", ""JFK"", ""Mississippi Burning"", ""Schindler's List"" and ""In the Name of the Father"". In addition to Rosenthal, the contributors are John Corner, George F. Custen, David Edgar, Leslie Fishbein, George MacDonald Fraser, Todd Gitlin, Douglas Gomery, Richard Grenier, Sumiko Higashi, Tom W. Hoffer, Jerry Kuehl, Steve Lipkin, Yosefa Loshtinsky, Ian McBride, Richard Alan Nelson, Conor Cruise O'Brien, Derek Paget, Robert A. Rosenstone, Betsy Sharkey, Irene Shubik, Jeff Silverman, D.J. Wenden, Sita Williams and Leslie Woodhead.